Don’t allow employees to eat Pizza that tastes like cardboard from one of those large pizza chains! Looking to treat your employees to the best pizza and hot & cold catering in Brooklyn? Bay Ridge Pizza understands that your company has better things to do then spend all day ordering food. That’s why our Corporate Account Program was designed to make things easy for you. With a Corporate Account at Bay Ridge Pizza, you can be sure that your catered food will be delivered on time to the correct location. 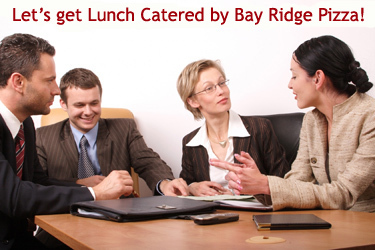 Bay Ridge Pizza offers table service in your office location. We supply, setup & cleanup everything! We can also handle standing orders, so you can avoid the hassle of repeating the order week after week. All of our Corporate Account clients receive discounts of at least 10% on all of their orders. The discount level goes up from there depending on the size of your order. Best of all, even when your company isn’t paying, we’ll still extend this discount to your employees when we deliver to your location! Want more information? Ready to sign your company up? Call us at (718) 680-5405 and ask to speak with Gaspare.